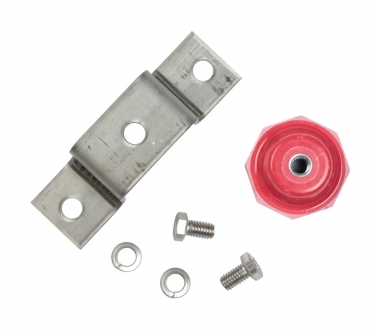 5/8” Ground Bar Mounting Kit. Single post. Home/ SHOP OUR STOCK/ Ground Bars & Ground Bar Kits/Ground Bar Accessories/Ground Bar Mounting Kit/ 5/8" Ground Bar Mounting Kit. Single post. 5/8" Ground Bar Mounting Kit. Single post. Storm Power's Ground Bar Mounting Kits eliminate guesswork by matching the correct standoff insulators and mounting hardware to the ampacity load of the grounding bar. Standoff Insulators: The insulator model 5263-S8 creates an insulating air gap between the busbar and surrounding material. Manufactured from high grade, glass reinforced polyester which has very high mechanical strength and resistance to shattering, these insulators are especially good at preventing 'tracking' of current even in high temperatures and humidities. They are fitted with steel thread inserts, making installation quick and easy. Call 1-866-716-9773 for quantity pricing. 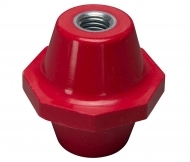 Internal Thread (Insert Side): 5/8"-11 x 3/4"
Standoff Insulator- 2.5" diameter , 2.625" high, octagonal profile, with .625"-11 x .750" thread.